We offer an effective system of active cathodic anticorrosive protection to guarantee functional safety and extension of lifetime of steel equipment stored in water or in earth against effects of electrolytic corrosion. Especially suitable it is for steel tanks and short sections of tubular circuit covered with passive coating isolation. The purpose of active cathodic protection is to prevent formation of rust in places of rupture of passive isolation, which accrue from defects at fabrication or assembly, or as result of aging of insulation materials. This possibility never cannot be excluded. Galvanic anode (2,0 kg or 4,0 kg net) of magnesium alloy prepackaged in cotton bag, filled with backfill. Amount of anodes depending on size of steel construction (S1, S2 or S4). 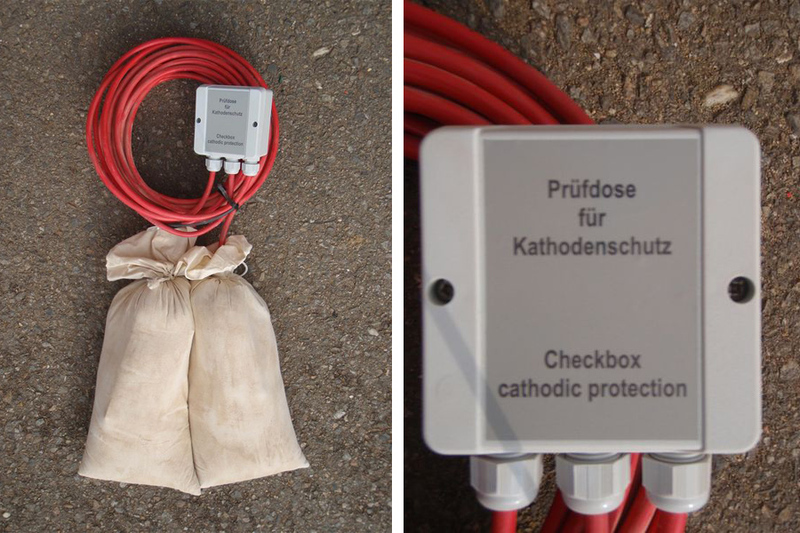 Connecting box, which connects galvanic anodes with protected construction and which further enables to conduct check measurements. Connecting cable (length 6m) links connecting box with protected construction. Cathodic protection is a strong safety and economy tool, which brings to their owners increased safety and high savings on running and servicing of realized investments.